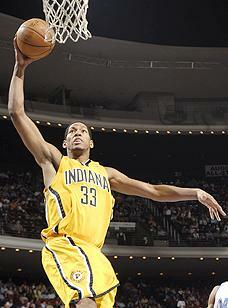 Can Danny Granger continue his evolution into a multi-category monster? Even those who expected an emergence from Granger last season were likely surprised. He obliterated his per minute numbers in nearly every category. He averaged 19.6 points, 2.1 3-pointers, 6.1 rebounds, 1.2 steals and 1.1 blocks per game while shooting .852 from the line. Granger suddenly emerged as a multi-category monster and into the fantasy elite. So the questions begs, will his numbers regress to the per-minute numbers he showed during his first two seasons or will he take yet another step forward and become even more valuable? The answer lies in Indiana’s offseason moves as the departure of Jermaine O’Neal and acquisition of T.J. Ford may allow Granger to play a little bit more off-the-ball on the inside, meaning more rebounds and an improvement of last season’s .446 FG%. Not to worry, though. Indiana’s offense still relies on the 3-pointer and Granger will get plenty of those as well. When to draft him: In the middle of the second round. Dunleavy posted a career year in 2007-08, but things can be a bit deceiving. Compared to his previous per-minute numbers, Dunleavy was a better in points and assists but was actually worse in steals and rebounds. Upon further review, since Indiana lacked a true point guard, Dunleavy had the ball in his hands more than any other time his career. Plus Indiana’s reliance on the 3-pointer meant Dunleavy was shooting from the outside more than ever (nearly five 3-point attempts per game). The white wonder also shot a career high .834 from the line, which amplified his sudden prolific ability to score. If Ford stays healthy, don’t expect Dunleavy to provide the same value in assists again, but he has clearly shown the ability to be an outside marksman and his other numbers shouldn’t change much. When to take him: In the late fourth or early fifth round. Ford holds they key to the fantasy value of many Pacers. If he is able to stay healthy, his ability to speed up the offense and get the ball teammate can help Granger, Dunleavy, Troy Murphy and Jeff Foster immensely. After two relatively healthy seasons, Ford missed 31 games with Toronto in 2007-08 and was stuck splitting time with Jose Calderson, a situation that was beneficial for no one (including fantasy owners). There is always concern about Ford’s balky back, but he is the undisputed top point guard and a team with plenty of offensive weapons that can shoot and get to the basket. His assist numbers will typically be his greatest asset, but his steals (1.5 per 36 minutes career) and FT% (.808 career) will help as well. Ford’s biggest drawback is that he shoots very few 3-pointers for a point guard. As a result, he is right outside the top couple tiers of point guards. When to take him: In the seventh round. Yet another Pacer who loves the long ball, Murphy buried a career-high 1.3 3-pointers per game last season and showed a slight bounceback in his rebounding, averaging 7.1. He clearly benefits from Indiana’s uptempo style and the addition of Ford will only help his performance. Murphy is also a solid, though inconsistent free-throw shooter, with a .780 mark from the line for his career. He is just a career .438 shooter from the floor, however. Early reports have coach Jim O’Brien talking about using Murphy more in the post. This would cause a likely decrease in his 3-pointers, but his FG% and rebounds would increase. Too early to tell what his role will actually be. When to take him: In the eighth or ninth rounds, nine rebounds and a 3-pointer per game aren’t out of the question. If you’ve ever watched Foster play, you know he is dirty and awkward and an irritating sight to behold. But the guy has averaged at least 11 rebounds per 36 minutes in EVERY YEAR OF HIS NINE-YEAR CAREER. Without O’Neal around anymore, the paint and every missed 3-pointer that this team launches will be Foster’s to grab. He does nothing else of note on the court – even his .550 FG% doesn’t matter much when he takes less than five shots per game – but he is as good at his one category as anyone on a per minute basis. When to take him: In the last coule rounds, when the specialists are flying off the board. Wondering about Jamaal Tinsley? Well he will not be on the Pacers to start the season. They are desperately trying to trade him and so his place in the fantasy world will be elaborated upon when he finds his new team. Jarrett Jack would be an extremely valuable guy to have in case Ford gets injured and will be drafted late in a lot of leagues. He has always had solid per minute number providing assists, FT% and some 3-pointers. Rookie Roy Hibbert is getting a lot of praise after a successful summer and may be a valuable center, rendering Rasho Nesterovic useless. Be sure to check your league rules for specific position eligibility rules.